The Mars Science Laboratory (MSL) lifts off in a picture perfect launch from Pad 41, Kennedy Space Center at 10:02 am EST, Saturday morning, November 26, 2011. The MSL will land on Mars on August 6, 2012, at Gale Crater. It will begin an exploration that could last years. 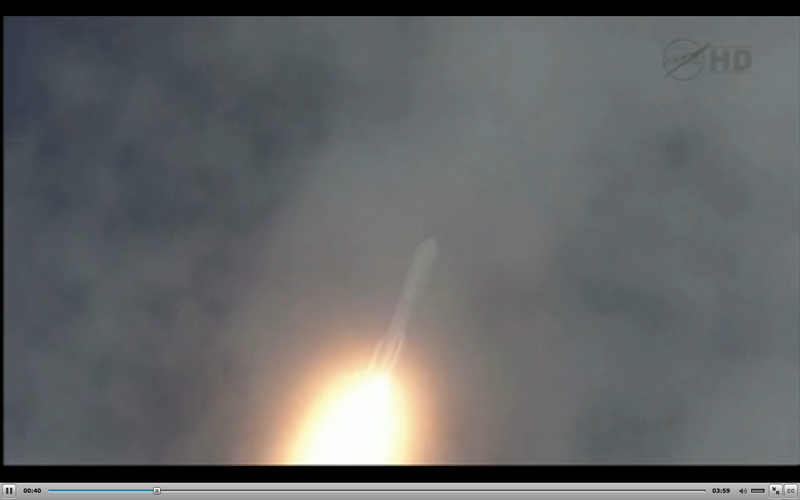 The current header shows the MSL several more seconds into the launch. Control of the MSL mission will be in Pasadena, California, at the Jet Propulsion Laboratory which developed Curiousity and managed to sneak its name onto the rover’s tire in Morse Code. Yeah, I took these launch photos (CLICK to ENLARGE them) from the roof of the Vehicle Assembly Building at KSC. This is a series of about 20 photographs of the launch, many of which will be posted here in coming days. I will also post photo reports, day by day, starting on Monday, November 21 (L-4) through the launch on November 26 (L-0). Because of Thanksgiving, L-2 was Wednesday, and L-1 was Friday. The launch count was suspended for a day on Thanksgiving. View both of these videos in Full Screen if you can. The shuttle Atlantis left the Vehicle Assembly Building for what is likely to be the final time on the evening of May 31, 2011. 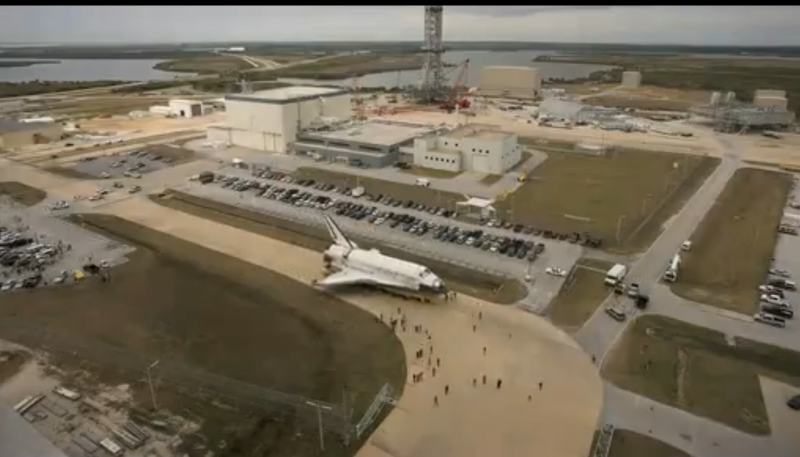 Shown here she is about 40 minutes into her journey from the VAB to Pad 39-A. Pad 39-A the only surviving shuttle launch pad; 39-B is being torn down. 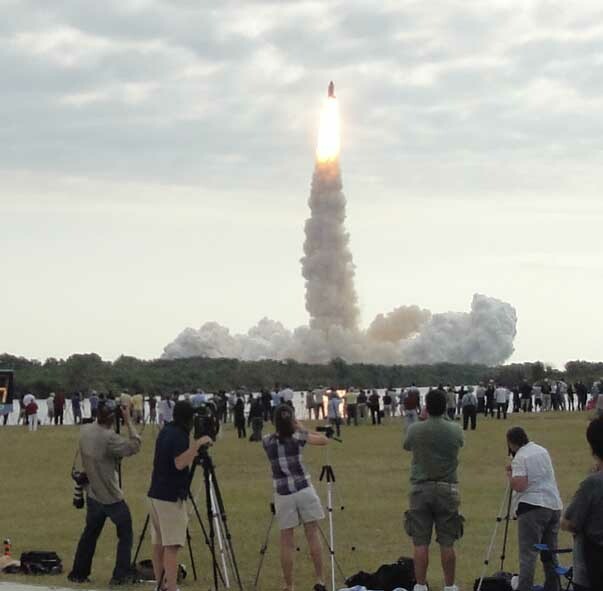 Atlantis is scheduled to be launched no earlier than July 8, 2011. Atlantis is on the right in the photograph, and her destination, Launch Pad 39-A, is tiny but visible at the left. 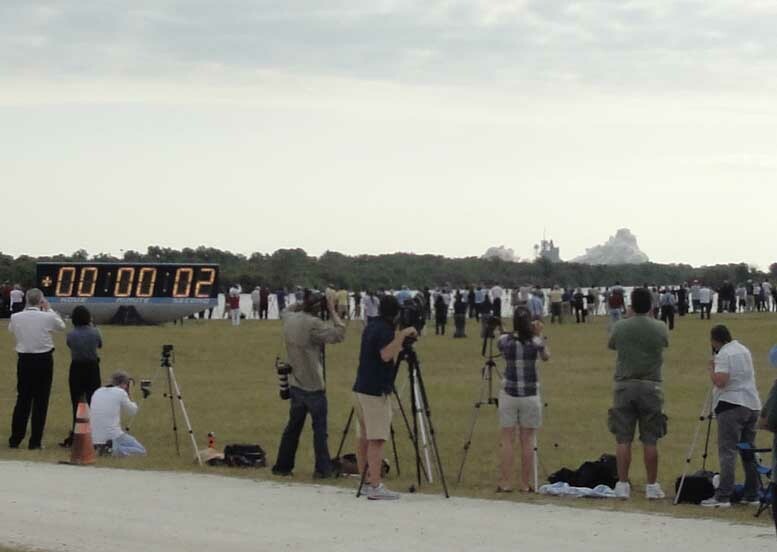 The journey from VAB to Pad takes about six hours and was completed shortly after a different shuttle, the orbiter Eneavour, had landed at Kennedy Space Center Shuttle Landing Facility on runway 15 (SLF = runway) at 2:32 am June 1, 2011. 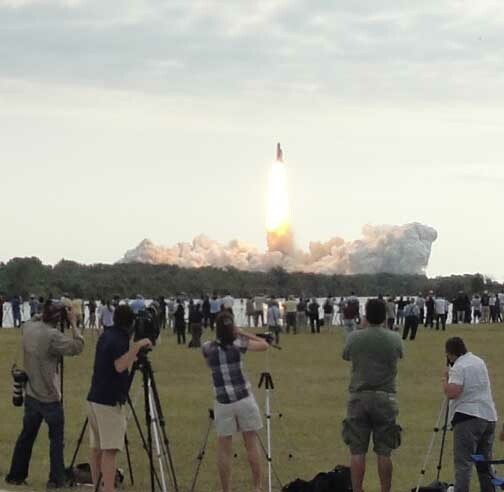 It was a big night at Kennedy Space Center, one of the biggest ever. The media first watched Atlantis be rolled of the VAB starting at 8 pm. By 2:32 am the media had moved over to the landing field, the Shuttle Landing Facility, to watch Atlantis’ sister ship, the Endeavour, return from space and land. Then 4:30 am a press conference on the Endeavour mission was held. At 6 am the media was back out at Pad 39-A to watch the sun rise over Atlantis. 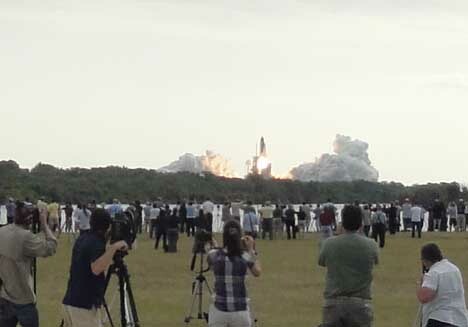 During the evening on May 31, 2011, the four person crew of the final shuttle mission on Atlantis, designated STS-135, were at Kennedy holding a press conference outside the media press center at the Complex 39 Press Center using Atlantis on the way to the pad in the background. By dawn, Kennedy public relations people, and the media, were exhausted. 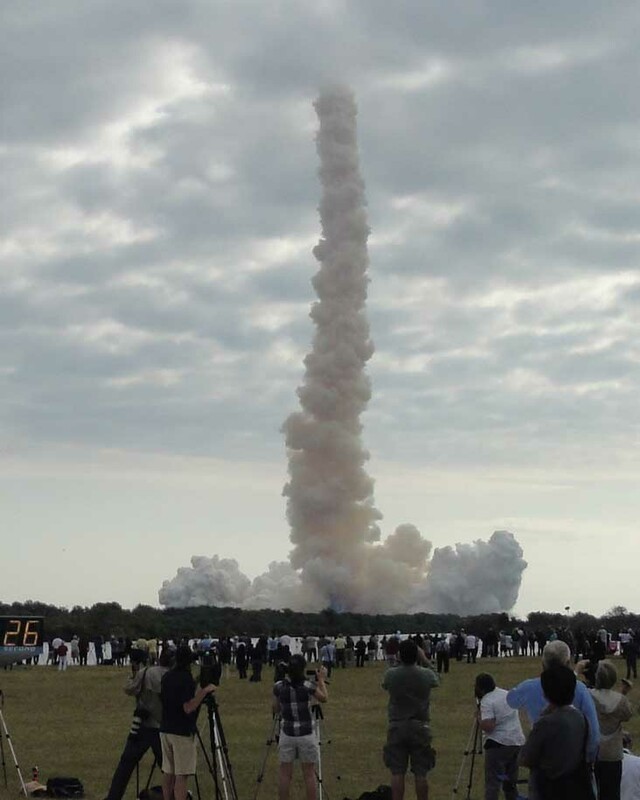 NASA’s stunning photographs of the launch of STS-134 are HERE. Pictures here are from 2 seconds after ignition through disappearance of the Shuttle Endeavour into clouds at 5,000 feet at about 8:57 EDT, Monday, May 16, 2011 at Kennedy Space Center, Florida. The launch is from the only remaining operational shuttle launch pad, Pad 39-A. Gone! 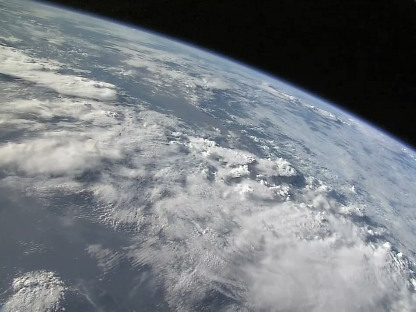 -- 26 Seconds into Launch. 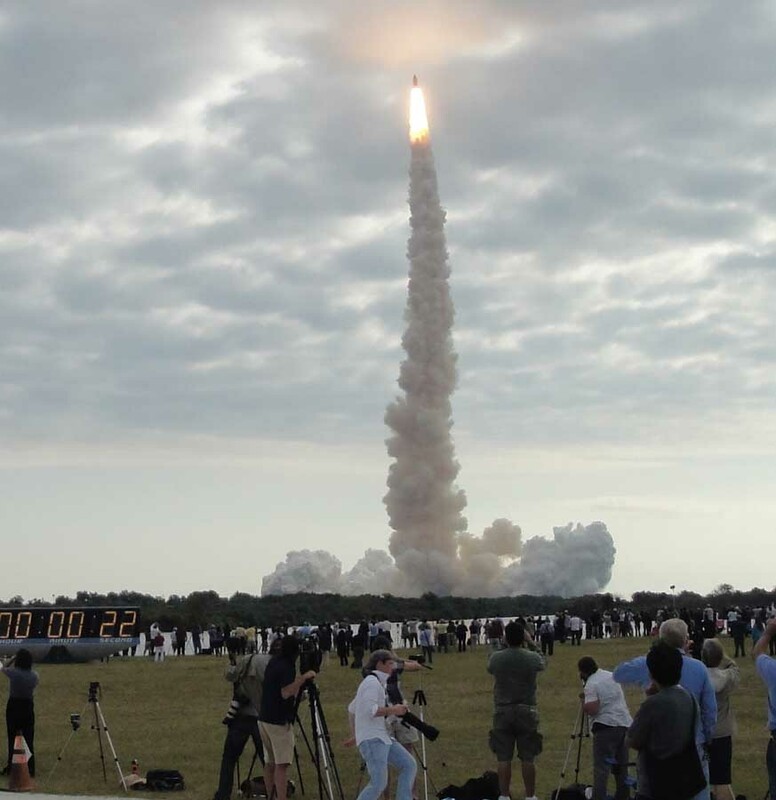 This was one of the quickest disappearance of the shuttle into clouds in the history of the program, a NASA spokesman said at a press conference later in the morning.